Hi ladies! Sorry I haven't updated for 2 whole weeks. I was quite busy with something but I'm now back to my regular blogging schedule - reviews and makeup looks. I'm still postponing the Ur Made Up Face Series since I'm waiting for responses from the beauty bloggers I want featured. If any of you are interested to be featured, don't hesitate to send me an email (joanne.cuaycong@yahoo.com). I'm also accepting makeup look requests so tweet me or message me anywhere - Instagram/Twitter: @urhappybunnie. A few weeks a go DressLily sent me this lovely necklace, a geo, statement necklace which you can use to glam up a casual outfit or wear to a fab night out or party. It's pretty well made for something that only cost $4. It's so chic that I decided to style it for date nights and red carpet events. NYC Sunny Bronzer - Ding the usual contouring - hollows of the cheeks, jaw, temples and sides of the nose. Stila Lip Glaze in Believe - Skipping lipstick, I went for a non-sticky gloss with a slight plum tint to it. I'm using neutral shadows from my Urban Decay 15th Anniversary Palette. I thought I'll bust out this baby and use it as much as I can since it hasn't been getting any love for the past year. Since I'm using neutral shades, this is very dupe-able so I'm sure you can find alternatives in your own collection. Urban Decay Primer Potion in Original - We want this eye makeup to last all night, so definitely use a primer. UD Eyeshadow in Naked (Naked Palette) - With a fluffy blending brush (Sigma E25/MAC217) take this shadow and apply it on the crease as a transition shadow. This will just help things blend out seamlessly. UD Eyeshadow in Deeper - Apply this right on top of the Naked using the same brush and blend it out. 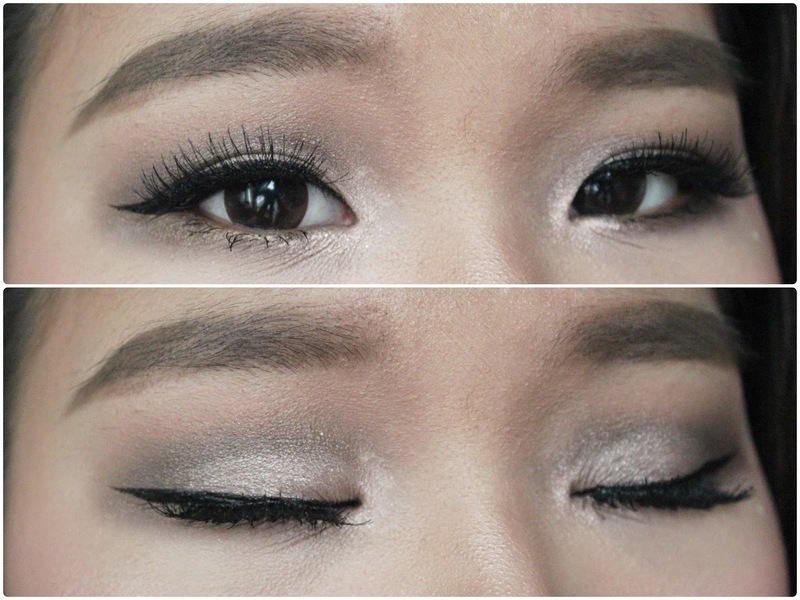 UD Eyeshadow in MIA - Apply it on the outer V and deepen the crease with a crease/dome brush. Bring it inwards for a defined crease. Bring it on the outer half of the lower lash line and thoroughly blend out the harsh lines with a clean fluffy brush. UD Eyeshadow Vanilla & Midnight Rodeo - With a flat brush, mix the two shades and pat it all over the lids, the inner corner and the inner half of the lower lash line. Go over with a brush you used for MIA along the crease to blend out the shadows. Urban Decay 24/7 Glide On Eye Pencil in Zero - Use any black liner to tightline. Red Cherry False Lashes in 747S - Curl the lashes, apply one coat of mascara on the top of bottom lashes and apply falsies. Hope you girls enjoyed this look! The necklace from Dress Lily really made this look so fab. Don't forget to check out Dress Lily for cheap and fashionable clothing, shoes, jewelry, accessories and more!